Home body drink water water weight weight loss HOW MUCH WATER DO WE NEED TO DRINK, ACCORDING TO OUR WEIGHT? Water is found in abundance on mother Earth. Nearly 71% of Earth’s surface is constituted by water. The water is one of the most important elements that keep humans alive, due to its minerals that keep humans alive and kicking. Drinking water maintains a good metabolism in the body, helps one lose weight and keeps the skin acne free. Additionally, water aids in keeping good digestion and plays an important role in the excretion of unused substances. We have to drink plenty of water, because in this way we prevent the formation of kidney stone. It is a fact that water possesses its own vitamins and minerals, and it should not be mixed with other food. According to some studies, water should be taken 15 minutes before having a meal and 20 minutes after finishing a meal. The amount of water intake should also be taken into consideration. Drinking just 2 cups of water, before meals will help you maintain your weight loss. Here are a few tips to be adhered to calculate how much water one needs to drink in order to stay healthy. 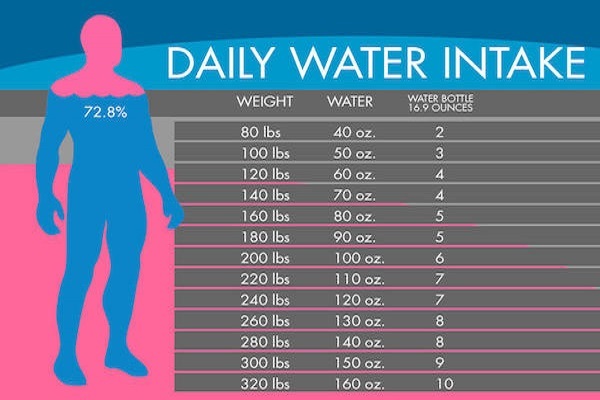 The first step to knowing how much water to drink every day is to know your weight. With the weight one can decide how much water one needs to drink in a day. Next, you need to divide the weight by 2, in order to determine how much water to drink daily. The result of the weight divided by 2 will give a figure as to how much water in ounces does one need to drink in order to lose weight. For example, if you weighed 150 pounds, then the amount of water intake in a day for the concerned person is 75 ounces. Activity level is the last factor that decides the amount of water intake one needs to have. The person who sweats more adds more ounces of water to his daily intake, when compared to a person who sweats less. You should add 12 ounces of water to your daily intake. Drink 2 cups of water (16 ounces) before every meal. This is 48 ounces a day. Also, have one glass of water early in the morning and one before going to bed. That is an additional 32 ounces.